But is that with reason? However in the film chaos ensues. Colonel Eric Byer (Ed Norton) is the government man who ‘will make the hard calls’ and do ‘whatever it takes to protect this great nation’. Apparently that means shutting down the entire operation – and anyone in it. Now as the film’s tagline ‘There was never only one’ suggests this is especially unfortunate for a large number of people, though for the purposes of the film most notably for Aaron Cross (Jeremy Renner), and Dr Marta Shearing (Rachel Weisz), a scientist charged with furthering the project. And being good government employees shut it down they do. Abruptly. Now Aaron Cross was part of the same group of Mr Everything’s that Bourne ‘forgot’ about in the first film, along with many others spread over the globe. Cross is as well trained, proficient and tactically savvy as his predecessor, with a side of Bear Grylls and Sly Stallone from Cliffhanger thrown in for good measure. He takes none too well to being targeted for destruction and in essence turns into Jason Bourne Jr, for better or for worse following the template of all prior films to some degree. In ‘Legacy’ though this results in Cross yet again seeking to get to the bottom of whoever conspired to X him out. This means he teams with the only person he knows on the inside, being Dr Marta, one of the crew who helped ‘engineer’ him and his peers. While this all sounds remarkably similar to the films that went before it – and it is – alas this only serves to dish up a steaming helping of Bourne Lite for a good 90 minutes. Sure there us globe-hopping and a couple of brief action sequences, but the first two acts are far more ‘cloak and dagger’ than ‘cut and thrust’, with the solid mix of action and discovery from Bourne Ultimatum long gone. With a cast of ‘he’s so hot right now’ Renner, the ever reliable Weisz and the excellent Norton this sure isn’t the cast’s fault, even though they aren’t asked to do more than look determined. Norton especially must give the appearance of urgency and tension despite never seeming to leave a big room full of monitors and computers. The supporting cast (featuring more than a couple callbacks to earlier films) is equally strong and uniformly good. The crime – if there is one – of Bourne Legacy is that it is simply too deliberate for its own good, especially as we’ve seen all this before with B2 & B3, and done better on both occasions. In fact were it not for an excellent last quarter hour I might have dumped this film in the muddy purgatory of not-crappy, not-worthwhile, the home of lazy cookie cutter blockbusters, the bland and the flawed. But the finale kick’s much arse in a breathtaking motorcycle chase through the congested Philippines highways and will definitely leave any action fan grinning as they exit the theatre. While it is a pity the opening 100 minutes couldn’t match the pace or tone, I’d still rather watch this that the latest Resident Evil, the Judge Dredd reboot and frankly anything Will Ferrell will ever be paid to appear in. Final Rating – 7 / 10. The fourth film in this most steely eyed of franchises takes the film in (not) new and (still not) thrilling directions. 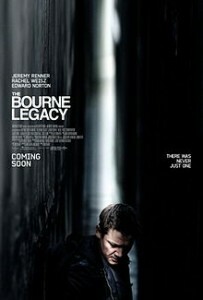 Despite this 360 degree change of tack – that leaves the film facing straight ahead – I could still stump up for Bourne 5.